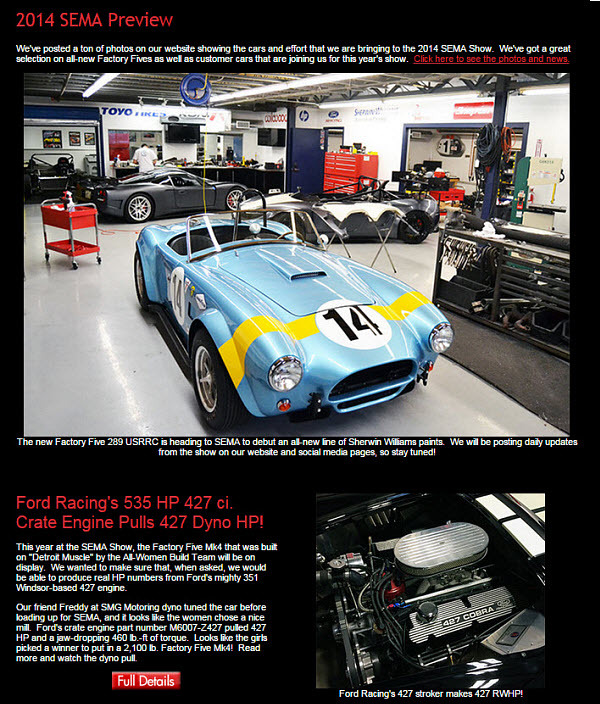 SUMMARY: In transitioning from a print to email newsletter, Factory Five Racing was focused on one main goal: understanding more about its customers. By looking at simple metrics and curating compelling content, the marketers at Factory Five grew its email list 840% and have provided customers with a community to help them with a long and thoughtful purchase path. Factory Five Racing was founded in 1995. Dave Smith, the owner, started it with his brother, Mark, to make a more affordable modern day car. The two brothers came up with a concept where "you have modern technology with vintage looks, which is how we kind of pitch the idea of our company. It's grown with several replicas … and now we've also ventured into our own designs, our own original kit cars," said David Lindsey, Webmaster, Factory Five. In marketing to its customers, Lindsey said the company tries to show "what we do, but we also show the finished project because we sell projects. We don't build the completed car. We're selling the kits." Lindsey explained, the customer comes to Factory Five and buys, for example, the Mk4 Roadster. However, they end up actually buying the parts — the chassis, the suspension — all these parts that one day become an AC Cobra replica, which is what the company calls the Mk4 Roadster. "We're basically selling a project for guys to build in their garage with their family and friends," he said. The team is trying to communicate that basic idea in its marketing — that people are buying a project. "We like to say 'built not bought,' or 'build your own legend' are some of the tag lines we use in our marketing. We're trying to convey that you are building the car of your dreams. You're not just going to the showroom and buying it," he said. "We always have cool stories going on, and we try to use that because we have a list of almost 250,000 active members," Lindsey said, explaining that a large portion of that population are men who have signed up for information during a trade show or after visiting the website. Most subscribers haven't quite purchased yet and may have a while until they're at the purchasing stage. Since these are involved projects, purchases are not made on a whim, and customers need a lot of information and familiarity with the brand. One of the things the team tries to do in the newsletters is not to just inform customers about company news and products, but to actually turn those topics into a story the customer can visualize for themselves. "We get a lot of customers sending us pictures of their builds, father-son builds, the family going through the inventory to check off everything or winning a car show. We're like, 'This could be you. You see what this customer did? This could be you,' and that's what we're trying to show people. Get them involved," he said. The newsletters also inform customers about what auto shows Factory Five will attend and at which shows other Factory Five customers have won awards. These emails also include some product updates and sale information. "We do include that stuff, but we try and also share a lot of stories of our customers that are building our cars and what they're doing with them and try and get them involved in the community because our community is one of our biggest sales tools," he said. Before, Factory Five was on a email service system, and the team wasn't getting statistics beyond going to Google Analytics and seeing an increase in website traffic. "We can see that on January 23, we sent out an email and there was a little spike in our Web traffic. Beyond that, the system we originally started with didn't really give us any stats because it was a cheapo, out-of-the-box, do-it-yourself system," Lindsey said. Factory Five utilized a newer email service provider with the objective of seeing more metrics and using those to develop a greater understanding of its subscribers. "We try and not spam people. That's one of my big concerns is to make sure we don't over-send. We don't want to be one of those places that become annoying by sending out a daily or even weekly newsletter. We tend to keep it to one or two emails a month, maybe three," Lindsey said. He added that a promotional email, such as one about the company's winter sale, will be included in that month, but the majority will be traditional newsletters, which inform customers about what's going on within the company. The team tries "to keep it more community-focused, more casual and less sales pitch-like to keep our customers engaged and not become that annoying sales place," he said. When Factory Five switched from its old email service provider, they started to try and experiment with email marketing, which led them to discovering a new provider that "got us off the ground." The objective at this point was to see metrics and benefits for managing the Factory Five subscription list and be able to experiment more with email marketing, while trying to increase open rates — eventually bringing more leads to the company. 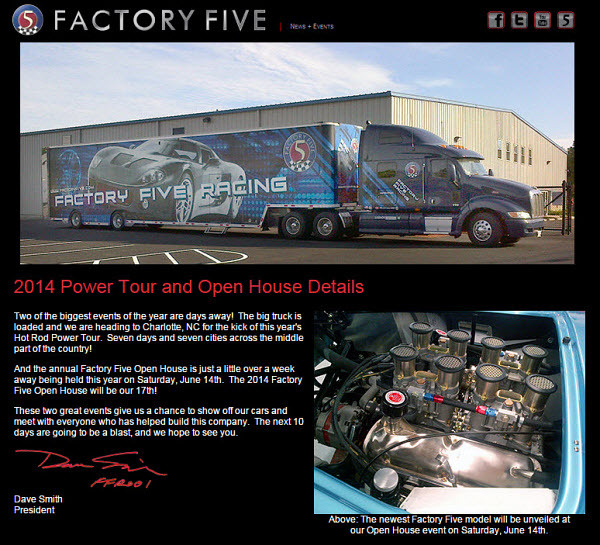 "From day one, when we started using the out-of-the-box system, it's always been kind of transitioning from a print newsletter to a monthly newsletter," Lindsey said, adding that as print becomes more expensive and more people switched to digital, it became clear that Factory Five's audience needed to communicate mainly through email. "Print takes so long that by the time … we were sending out, that stuff's getting a little dated," he said. The objective when switching over to emails became fostering the community of Factory Five customers. With email, it was easier to connect current customers to interested buyers. When switching over from the initial ESP to the new platform, the team was able to accomplish this goal better by running small tests on factors such as layout and story size. Also, subject lines were tested to improve open rates. "It's always kind of been more of the newsletter type of email since day one. We've just kind of evolved how our newsletter is being expressed. And each one [doesn't] have to be 10, 15 stories long. Sometimes we can have one that's two or three, and that gets the point across. We change it up as each month or as each send requires," he said. Lindsey and Factory Five owner Dave Smith then sit down and review potential stories, deciding which ones should be condensed and sent out into a short email. "We go through our process naturally as we're putting everything together and bounce ideas off each other to get the structure of the email worked out as we're writing it. Then, we'll send it to some of our coworkers here … to proofread and make sure links aren't broken. And then give it one more read-through and hit send," he said. Because email is new for them, Lindsey and Smith can also be creative and decide how to best use it to serve customers. "This past December, at the end of it, we decided, 'Let's do a huge Best of 2014 email,' which we've never done before. We ended up having 20 stories, and we thought, 'Hey, this is too big for one email, so let's do it as a Web post, and let's do a compressed-down email,'" he said. The emails offer an important opportunity for Factory Five to help potential customers visualize the product and how a purchase can fit into their own lives. "We actually have a lot of guys that are like, 'I've been dreaming about this my entire life. I'm just about ready to pull the trigger on doing it.' We got a lot of builders that are saying, 'My kids are almost through school, so once they graduate, it's me time, and I'm going to build one of your cars,'" Lindsey said. He added that there are also customers who see Factory Five magazine ads or featured on a television show, and say, "'Oh I've got to have that,' and purchase one within three months." However, email is a connection to "the guys that have been waiting 10 or 15 years to do this. So we want to keep them updated and keep them interested in Factory Five through our emails, just to keep their stoke on and their excitement about the project going as opposed to annoying them," he said. It is paramount, due to the long lead time most customers have, to not use emails to consistently push sales or promotions. "We try and keep the community aspect and the fun aspect of the build and the cars and our community as the central focus of the emails, just to keep everybody excited about it," he said. They do occasionally send sales and promotion emails but try to keep them infrequent and informational. "We're not Best Buy or Amazon, always trying to convince you to buy something … we understand that this is not a spur-of-the-moment decision for 99.99% of our customer base. There's some thought that goes into this," he said. Another, simpler reason why Lindsey tries to keep promotional content to a minimum is because, "honestly, that's kind of boring. And we know a lot of people put it right into their email trash can. So we try to keep it more of a human interest story email." Since the ESP switch, Lindsey has a lot more data to review, and each send he tries to pull as much customer information as possible. "We'll look at the open rate and look to see what we did differently. What subject line did we use, what content was in there? We debate, 'Is this one working better? What makes this one have a higher open rate than the previous one?'" he said. They are constantly analyzing each small piece of information, trying to figure out what this data is telling them about the customer, beyond just higher rates. "[We're] trying to figure out what attracts our customer, what attracts the person receiving the email to actually open it and not just ignore it a few days later or delete it altogether. We're trying to always look at what we did previously to try and make the next email better and get our open rate and clickthrough rate higher," he said. The objective of these emails is to not only keep the customer informed and excited about the project, but also encourage the customer to keep clicking through to and visiting the website for more information. Lindsey said that they have observed open and clickthrough rates being higher at certain times of year and during big events in the automotive sphere. "This past November, we went out to promote us going to the annual SEMA show, which is a huge automotive show in Las Vegas every year. All the companies show off their latest and greatest stuff. So anybody that's following us knows that's when we're going to have some cool stuff to display and talk about," he said. Open rates are also higher in August — at the tail end of car show season — when Factory Five has collected a lot of customer stories from those events to share. Rich content from those events is a main factor in driving up engagement, he added. "I don't think there's anything we can really necessarily plan to make sure the next one is going to be a high open rate. We just have to learn from the previous ones. [For instance,] 'How can we word this to make it seem just as exciting as the SEMA show, even though it's more of an everyday type of an email to just keep our customers excited?' I think that's the balance we're trying to find," he said. Since changing ESPs and taking a greater interest in using metrics and engaging customer content to drive the Factory Five email program, the list has grown by 840%. Lindsey believes the growth is further proof that digital marketing is right for Factory Five's customer base. "People are excited to see what's going on at Factory Five and enjoy getting a monthly or biweekly email update as opposed to a quarterly or even one or twice a year newsletter in the mail," he said. The valuable content is a huge factor as well because "people just want to know what's going in the world of Factory Five because it's interesting, it's exciting,” Lindsey added. "There are always different projects going, whether it's one that we're doing or one our customers are doing." For the future, he said, they've decided to remain steady with their tack of focusing on content over promotions. "I think we've got a pretty good strategy, and we're just trying to tweak it. Trying to make a more attractive headline without using those typical, 'Check out this exciting newsletter from Factory Five,' and … we're just playing around with those aspects of it as opposed to trying to do a huge overhaul. I think we've got a pretty good groove right now and are sticking with it," he said.